There are 168 hours in a week. This book is about where the time really goes, and how we can all use it better. It's an unquestioned truth of modern life: we are starved for time. With the rise of two-income families, extreme jobs, and 24/7 connectivity, life is so frenzied we can barely find time to breathe. We tell ourselves we'd like to read more, get to the gym regularly, try new hobbies, and accomplish all kinds of goals. But then we give up because there just aren't enough hours to do it all. Or else, if we don't make excuses, we make sacrifices. To get ahead at work we spend less time with our spouses. To carve out more family time, we put off getting in shape. To train for a marathon, we cut back on sleep. There has to be a better way-and Laura Vanderkam has found one. After interviewing dozens of successful, happy people, she realized that they allocate their time differently than most of us. Instead of letting the daily grind crowd out the important stuff, they start by making sure there's time for the important stuff. They focus on what they do best and what only they can do. When plans go wrong and they run out of time, only their lesser priorities suffer. It's not always easy, but the payoff is enormous. Vanderkam shows that it really is possible to sleep eight hours a night, exercise five days a week, take piano lessons, and write a novel without giving up quality time for work, family, and other things that really matter. The key is to start with a blank slate and to fill up your 168 hours only with things that deserve your time. Of course, you probably won't read to your children at 2:00 am, or skip a Wednesday morning meeting to go hiking, but you can cut back on how much you watch TV, do laundry, or spend time on other less fulfilling activities. Vanderkam shares creative ways to rearrange your schedule to make room for the things that matter most. 168 Hours is a fun, inspiring, practical guide that will help men and women of any age, lifestyle, or career get the most out of their time and their lives. 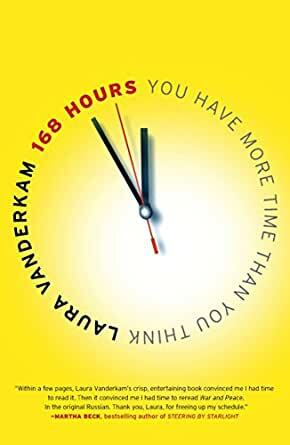 Laura Vanderkam is the author of the forthcoming book I Know How She Does It: How Successful Women Build Lives That Work, What the Most Successful People Do Before Breakfast, 168 Hours: You Have More Time Than You Think. A 2001 graduate of Princeton, Laura enjoys running and singing and serves as the president of the board of trustees for the Young New Yorkers' Chorus. She lives outside Philadelphia with her husband and four children. A visão da autora sobre o uso do tempo é muito interessante e os conselhos que ela oferece, na minha opinião, são mais duradouros que os macetes utilizados para fazermos melhor uso do nosso tempo. Obviamente, também são mais difíceis de implementar pois, exigem várias mudanças de hábitos. Ao ler artigos sobre a autora e seus fantásticos feitos, me empolguei em conhecer todos os seus livros. Confesso que acabei me decepcionando. 5,0 de 5 estrelasVery Good! Have and reading this book is very very good! Time is for life, to know what matters, delete everything is not important is to be happy with you and the world. I was looking forward to this book, and the premise and general information are good. However, the book was at least 3x longer than necessary (lots of rambling, tangents, and unnecessary repeating of points). And although the author says the book is for anyone, and I agree the basic premise is adaptable for anyone, she didn’t write it in an inclusive way. I found it very family with children focused and from a very privileged point of view. Also, her own preferences of what’s important shine through. All and all, not worth the time. I saw a Ted talk about this author and book. I think that Ted talk was more interesting and it got the whole book coevered in 15 minutes. I found the book too long and quite boring. I couldn't get myself to finish it. As interested i am in sorting out my time and life priorities i guess this book didn't do that for me. Sure there were some great points and that is great learning. But overall i would have liked the book to be cut in half. It is a time of year that is suitable for reflection with many people slowing down. You undoubtedly want to do achieve something or become something, but doing anything worthwhile has to be done well, and to do that, takes time. “Being busy has become the explanation of choice for all sorts of things,” says the author, Laura Vanderkam. We are too busy to read, spend quality time with our families, attend to our devotions, keep fit, and have a vibrant social life. Is all this only possible if you can find a part-time career paying full-time rates? Or as many work-life balance protagonists tell us, we need to lower our expectations to get it all in. Amazon list 35,000 books on time management, so why bother with reviewing this one? Because I think Vanderkam has insights worth considering. A Harvard Business Review article titled, ‘The Dangerous Allure of the 70-Hour Workweek’ suggests that the 60-hour workweek is no longer the route to the top, it “is now considered practically part-time.” But the Federal Bureau of Labor Statistics study in which work is actually recorded, shows this to be wrong. Americans sleep about 8 hours a night, just as we did 40 years ago, and we work a lot less than we think we do – on average ‘full-time’ logs 35–43 hours per week. Another study of those who really do work over 60-hour workweeks reports finding no more than 1.7 million Americans, just over 1% of the workforce. “I’m more interested in the woman down the street,” writes Vanderkam, “who—without benefit of fame, outsized fortune, or a slew of personal assistants—is running a successful small business, marathons, and a large and happy household.” We all have exactly the same amount of time. When we do meet the “woman down the street” we can only marvel at why and how she is able to fill her time with so many meaningful things, while others just dream of 15 minutes to take a bubble bath. This is the central question that this book answers. Here are some facts. There are 168 hours in a week – (24 hours a day times the 7 days in the week.) Planned well these 168 hours are sufficient to accommodate full-time work, intense involvement with your family, rejuvenating leisure time, adequate sleep, and everything else that you wish to accomplish. Do the math: even if you actually put in 8 hours of real, focused work each day, (see the facts above!) that leaves you 128 hours each week. If you sleep 8 hours a day so you are always fresh and well rested, that leaves you 88 hours each week. Put in an hour of exercise a day and you have 81 hours left. Spend 3 hours a day on housework and you have 60 hours each week… You get the point. We work less than we think we do, and we have more time than we think we have. The hard, but hopeful truth is that you can have all that time to allocate as you choose, but not without effort. Why do we think we are so time-starved? We lie. We are in so many ways, extraordinarily inefficient. What if we approached time differently: started with the unfilled 168 hours and viewed every minute, as our own choice? Instead of asserting firmly that we cannot do everything, we tell ourselves that we won’t be doing these things, because they are just not a priority in our life. When you say “I don’t have time,” you are making someone else responsible for your time: a manager, a client, your family. When something is not a priority, it turns those 168 hours back into a blank slate, to be filled as you choose it to be - with the things that you have decided matter to you. Recording how you spend your time as a time-diary study is a valuable tool, because it forces you to face the reality that a day has 24 hours and a week has 168. Everything we do must be accommodated within these limits. It will also force us to face another reality: we overestimate work and housework, and underestimate how much we sleep and how much leisure or discretionary time we actually have. Consider this: The problem may not be that you are overworked or under rested, it may well be that you have absolutely no idea how you spend your 168 hours. Perhaps you can be in better shape than you have ever been, because you’re sleeping enough and exercising enough. Perhaps you don’t have to choose between working to climb the career ladder and building a ladder for your kid’s tree- house, because there is plenty of time for both. To do this you will need to clarify two issues: what are your most important priorities, and how do you really allocate your time. Only then can you take time out to plan how you will use your 168 hours. While 168 hours is a lot of time, time is a non-renewable resource to be used very carefully. 18 pessoas acharam isso útil. I can't believe the negative reviews on this book. They are way off. However to give you a fair warning - this books isn't for everyone. If your not open minded, not looking to improve the use of your most valuable resource (time), you're absolutely in love with how you currently spend your time, looking for a easy done for you shortcut with no work or thinking, or you think that you have no control over your life and would rather have others control your time than this book is NOT for you. It's a book for people that want to "own" time rather than be victimized by the passing of it. School is never out for the "pro" so as a small business owner I find myself always working to improve my time management skills. One of the ways I do this is by reading a time management book every 12 months and have been doing this since 1999. Having read a handful of these books I'd recommend this book near the top of the list. It'll either be a great introduction to time management or it very good refresher. Either way it's worth the time to read. It's a very rewarding and eye opening experience to complete the exercises in this book and to reflect on how I could use the ideas to improve my life. The key to this book is to put the time into the exercises in the book and you'll get a huge value back out. 28 pessoas acharam isso útil. 5,0 de 5 estrelasThis book is life changing. 168 hours. We all have them every week. How you choose to use them is up to you. This book is much more than time management. It has helped me to dream again and figure out which priorities will fulfill me and which are just time drains. Read it and you wont regret it!